180 calories per bottle. Pop the cap. Savor the sip. Go. 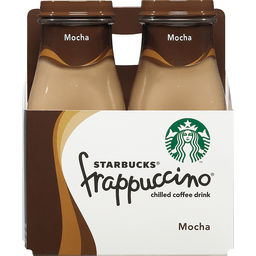 Mocha Frappuccino chilled coffee drink is a blend of Starbucks coffee and milk with chocolaty mocha. For a taste that keeps you going. Want more creamy, coffee yum? Try other flavors. Twitter: Follow us on Twitter: (at)Frappuccino. Facebook: Find us at: facebook.com/frappuccino. Check us out at Frappuccino.com. A good source of protein and calcium. You're good to go. Made from 100% recycled fiber with at least 35% post-consumer material. Partially produced with genetic engineering. With natural & artificial flavors. Caramelly intense. 290 calories per bottle. For comments or questions, call 1-800-211-8307. Frappuccino.com. Please recycle. 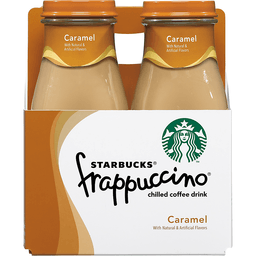 Starbucks® Frappuccino® Caramel Chilled Coffee Drink. Caramelly intense. With natural & artificial flavors. 200 calories per bottle. 4 - 9.5 fl oz bottles (38 fl oz). 4 - 281 ml bottles (1.12L). A good source of protein and calcium. You're good to go. Pop the cap. Savor the sip. Go. 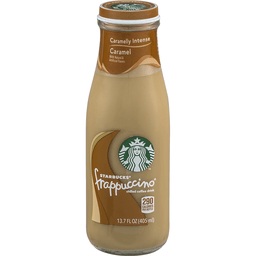 Caramel Frappuccino® chilled coffee drink is a blend of Starbucks® coffee and milk swirling with caramelly flavor. For a sweet burst of delicious. 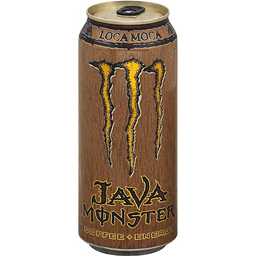 Want more creamy, coffee yum Try other flavors, like mocha light and vanilla light with 100 calories per bottle. Made from 100% recycled fiber with at least 35% post-consumer material. Partially produced with genetic engineering. Check us out at frappuccino.com. ©2016 North American Coffee Partnership. All rights reserved. 200 calories per bottle. Pop the cap. Savor the sip. Go. 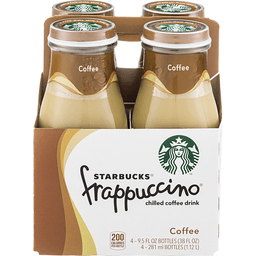 Coffee Frappuccino chilled coffee drink is a blend of Starbucks coffee and milk with a hint of sweetness. For just the right amount of pick-me-up. Twitter: Follow us on Twitter: (at)frappuccino. Facebook: Find us at: facebook.com/frappuccino. Check us out at Frappuccino.com. Made from 100% recycled fiber with at least 35% post-consumer material. A good source of protein and calcium. You're good to go. Partially produced with genetic engineering. Naturally and artificially flavored. 300 calories per bottle. For comments or questions, call 1-800-211-8307. Partially produced with genetic engineering. 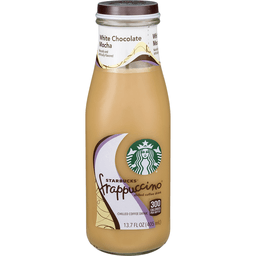 Frappuccino.com. Please recycle. 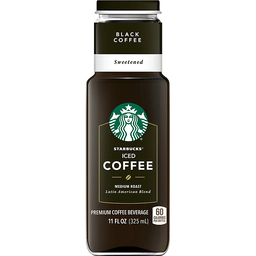 Premium coffee beverage. 60 calories per bottle. Partially produced with genetic engineering. 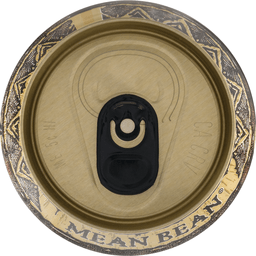 We select premium arabica beans to create a deliciously balanced medium roast. Then we add just the right amount of sugar. 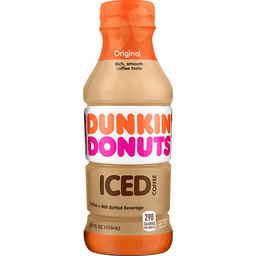 It's iced coffee at its finest with subtle sweetness in every bottle. For comments or questions, call 1-800-211-8307. Please recycle. starbucks.com/icedcoffee. 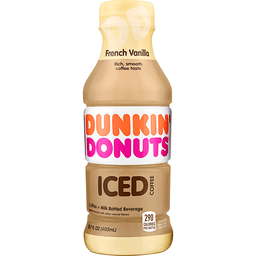 America’s Iced Coffee is now bottled and ready to go. 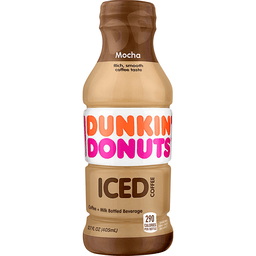 Each bottle is made with Dunkin’s rich, signature smooth coffee or espresso, for the taste you know and love. Get your on-the-go boost anytime, anywhere with these delicious flavors: Mocha, French Vanilla, Cookies & Cream, Original, and Espresso. Americas Iced Coffee made to keep you going and make the best of your day.